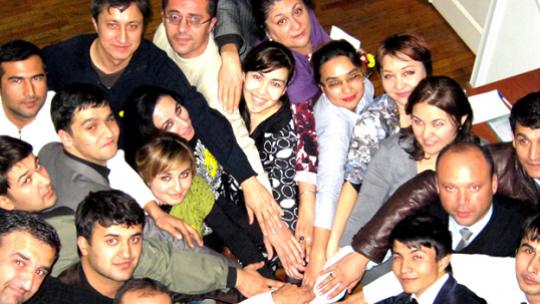 In April 2014, the MFI HUMO in Tajikistan achieved two important objectives in its development process. Back on these two events. HUMO pays attention to the development of regional economy and supports small businesses in general. HUMO began its business 10 years ago with loans to 1000 TJS (national currency of Tajikistan, about 150 Euros). Over the years, the microfinance institution has come a long way in its development and has achieved great goals. The institution's portfolio has grown to 30 million US dollars; the number of customers reached 34,000 people and gradually increased the amount of loans granted to 30,000 US dollars. In order to increase the size of loans, HUMO utilizes a method to analyze large loans and conduct specific trainings for the credit staff. The institution has moved to a higher level and in April of this year was disbursed the first major loan of 50,000 US dollars for the business expansion of old customer who has been credited in Dushanbe branch. HUMO has been present in the microfinance market of Tajikistan for ten years, being one of the leading microfinance institutions in this sector. On November 1, 2013 the National Bank of Tajikistan licensed HUMO to carry out microcredit deposit activity. This date became a significant event marking another step in the steady growth and development of the institution. On April 7, 2014 a solemn ceremony of opening the first deposit accounts was held in Dushanbe Branch Office of HUMO and was attended by such invitees as Irina Kalashnikova, the Supervisory Board member, Branch Directors and Department Managers. The event was inaugurated by Vaisova Mavsuda Saryevna, the Director General, who said: "We walked a long way towards this goal, and we understand that it is a huge responsibility of each staff member and the organization as a whole. A lot of work has been done to start this process. Now we have expanded a range of our services and can offer the institution’s clients opening deposit and savings accounts!" Irina Kalashnikova, the Board of Trustees Chair, became the first depositor of the institution. Her example was followed by some of Head Office staff. For the deposit introduction, HUMO has designed four products. Irina Kalashnikova expressed her appreciation and noted her readiness to support the institution in its innovations and further development.